1. Who first discovered the value of the cocoa plant? 2. Where, when, and by whom were the earliest cocoa plantations established? 3. What is the name of the drink made by the Mayans from cocoa beans? 4. Chocolate has not only historically been enjoyed for its flavor, but also for what purpose? 5. When was chocolate introduced into the United States? 6. By 1810, which country was producing half of the world’s requirements for cocoa? 7. By 1810, which country was consuming one-third of the cocoa being produced in the world? 8. When was the cocoa press invented? 9. In 1875, Thomas Jefferson wrote to whom, making a declaration about chocolate’s superiority over tea or coffee for both health and nourishment? 10. Why is lecithin used in making chocolates? 3. Legend had it that one could gain wisdom and power from eating the fruit of the cocoa tree. 5. In 1765 when cocoa beans were brought from the West Indies to Dorchester, Massachusetts. 8. In 1828 by C.J. Van Houten, a Dutch chocolate master. It was used to squeeze cocoa butter out from the beans. 10. It is used to reduce the viscosity of chocolate, and to lessen the amount of cocoa butter required in the manufacturing process. 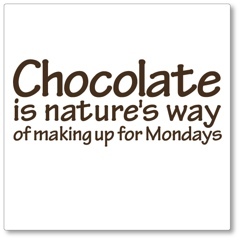 …Great chocolate manufacturers choose their beans in the same way as a wine-maker chooses his or her grape varieties. …Years ago, when harvesting was over, a dance was performed on the cocoa seeds which had been put out to dry in the sun. This tradition continues today in certain regions of Central and South America. …Africa is now the world’s leading producer of cacao , Ghana is a leading producer country. …In the Chuao Valley, In Venezuela, the cacao bean is still cultivated just as it was at the time of the Aztecs. …Wicker baskets, filled with cacao beans, were among the gifts which the Aztecs offered to the conquistadors. …For the Aztecs, cocao chocolate was a luxury and the cocao beans were like gold, a rare commodity that served as both currency and gifts for kinds and gods. …The Aztecs used to prepare a drink for the gods made up of ground cocao bean paste mixed with spices and corn. …The Imperial torte, a square chocolate cake with five thin layers of almond paste, was created by a master pastry chef at the court of Emperor Franz Joseph (1830 – 1916). …In 1900, Queen Victoria sent her New Year’s greetings to the British troops stationed in South Africa during the Boer War in the form of a specially molded chocolate bar. …The end of the Second World War marked a new era in chocolate advertising and image-making, which henceforth would be based on photography rather than the graphic arts. …On April 4, 1828, Coenraad Johannes Van Houten took out a patent for his newly invented cocoa press, which extracted the cocoa butter from the chocolate liquor, leaving behind powdered cocoa.